Sustainability means “the capacity to endure.” I use the concept of sustainability broadly in introducing the work that I’m doing as part of my Druidic path—people understand that term, what it means, and are immediately able to have some idea of where I am coming from. The reason I turn to the concept of sustainability (rather than eco-awareness, green living, environmentally-friendly or other terms) is that sustainability implies a set of actions and an end goal, whereas “green” and “eco” are now mostly associated with a set of products to be purchased. Avoiding consumer-based terms is especially important since the worldview and actions behind consumerism are huge parts of the challenge we face in creating more sustainable futures. In this blog post, I’m going to discuss the terminology and principles that are associated with sustainability, in particular, explore the connections between druidry and permaculture that give us both an ethical system and a set of core ways of interacting with the world. Two Australian designers, Bill Mollison and David Homgren, coined permaculture, or “permanent culture” in 1978. Permaculture is a design theory, a set of principles that we can use to help us design anything from a simple landscape or organic garden, to a building, and to a community of people living and working together. When I first encountered the concept of permaculture through a book called Gaia’s Garden: A Guide to Home-Scale Permaculture by Toby Hemenway (2009), I thought it was one of the most Druidic books I had ever read. This book helped radically shift my view and deepen my own Druidic practice by observing nature, using nature’s forms, recognize the cycle of nature and nurture that cycle in my own life, and so much more. In Permaculture: Principles and Pathways beyond Sustainability, David Holgren (2002) outlines three core tenets for permaculture. These three tenets (which form what I am calling an “ethical triad”) are useful for building more sustainable societies and align closely with much of the ethics and practice of Druidry. 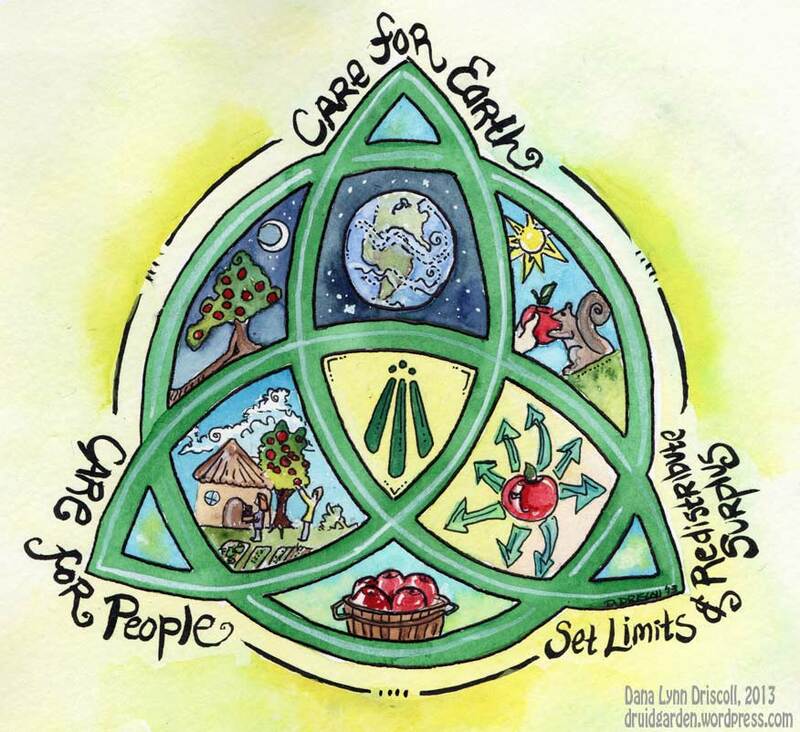 As Druids, “care for the earth” is at the core of our practices. It allows us to care in multiple senses—have reverence and respect for but also engage in direct actions that demonstrate our care. This principle also lends itself well to the divine belief systems of animism, pantheism, earth-based deity, and the earth mother, as well as seeing the earth as spiritually as well as physically connected. I have found that care is certainly a concept worth reflecting and meditating on in our own spiritual and life practices, and its one we’ll come back to in future months. Care for People. Permaculture does, inherently, recognize that people are part of the earth too, and that we have basic needs that must be met, although there are better and worse ways to meet those needs. Care for people also recognizes that we are not set apart from the world, but rather, we are at one with it. This gives us personal responsibility for our actions, and responsibility in taking care of ourselves, our families, our communities/tribes, and our world. Concepts like self-reliance, resilience, making use of what resources already exist also come into play under this ideal. Much of the practices of Druidry—meditation, self reflection, self improvement, building tribes and communities—also about care for people. A sense of “non-material well-being” is critical to care for people according to Holgren (year, p #). The principle of non-material well-being is part of our spiritual tradition—we value the intangibles, the arts, and the things that have little to no material wealth in our current culture, and we also learn to better value ourselves. Set limits and redistribute surplus. Different permaculture authors describe this final principle in various ways; Holgren (year) suggests that we “set limits to consumption and reproduction and redistribute surplus” (p#), and it aligns well with Druidry. First, it affirms that there are limits to what our lands can sustain and that setting limits within our own lives, communities, and broader world is important for sustainable change. To understand more about our world’s limits on a larger scale, I highly recommend the book The Limits to Growth: 30-Year Update (Meadows, Randers, and Meadows, 2004). This third principle also recognizes, however, that the earth is abundant, and with proper care and tending, she can produce so much for us. I’m reminded of the principles of limits and abundance each year in the fall; the hickory tree in my yard produced an abundant harvest of hundreds of pounds of amazing nuts. I could go and pick every last nut, but if I did so, there would be no nuts for the squirrels and chipmunks that depend on hickory as a major food source. I set a limit of gathering nuts to once every other day; this allowed us all to have our share. Permaculture design therefore, focuses on understanding balance—a lesson we Druids are reminded of every solstice or equinox. Redistribution of surplus is not a value understood and enacted in our present culture beyond basic understandings of “charity” work, but it is a principle that is at the core of sustainable societies. Redistribution doesn’t just refer to money, but rather anything that can be recycled and reused in new ways. A forest is a perfect example of a closed redistribution system—nothing at all is wasted in a forest. The trees fall and are host to bacteria and lichens; these break the remains of the tree down into fertile soil; nutrients in that soil is taken up by plants, which are eaten by animals, and who die and are returned to the soil, and so forth. Permaculture design asks us to see everything in our lives, every object, scrap of food waste, and so forth as something that we can redistribute rather than throw away. Nothing truly goes “away” as the earth itself is also a closed system. The druidic principle of the cycle and circle is particularly useful here. Holgren (2002) suggests that redistributing surplus was actually one of the reasons that so many indigenous traditions (including our spiritual ancestors) gave offerings. It was a sign of giving back, of recognizing the harvest and honoring the land, spirits, and gods who allowed that harvest to happen. In my first article, I suggested that one of my offerings was living a sustainable life—this too is a way of redistributing surplus. Conclusion. These three tenets within permaculture can help us understand and enact more ethical, sustainable living within the world around us. The principles are useful as themes for meditation, as mantras, and as providing us with an earth-centered ethical system. In addition to the three principles, permaculture has twelve principles to help us enact these tenets in sustainable ways, and I’ll be exploring these over a series of blog posts in the upcoming year. I would also love to hear from you—how might you be living these principles in your life, either consciously or unconsciously? How might we extend these practices in various ways into druidry and other earth-based spiritual practices? Sustainability: action in harmony with nature. I like that one better–I was using the “standard” definition in that post :). Haven’t heard from you in a while Alex–hope you are doing well! Business has been keeping me busy. I have incorporated my definition into my business processes. I find that I end up mostly thinking about the ways my life is *not* sustainable. In fact living sustainably frequently puts one in direct conflict with expected ways of life in this society. People look at me funny when I save containers and reuse them. They think I’m poor or low-class because I rarely wear new clothes. And so on. Your section “set limits and redistribute surplus” was new to me and good food for thought. Since I’m a nitpicker by trade, I must point out one thing: lichens aren’t really tree decomposers. Fungi (mushrooms) are decomposers, but lichens do very little to break down wood. Reblogged this on Musings of a Hellenic Druid. I’ve just discovered your beautiful blog and will be back for more of your insightful information for sure. I’ve created 2 mandala gardens using sacred geometry and the earths energy grid lines using geobiology tools such as dowsing and will be creating more of these this summer – thank you so much!